We were recently asked by a reader what was involved in installing a 12-volt power point capable of powering a GPS unit on a motorcycle. The answer is less than $20 in parts, a half-hour to spare, a bit of knowledge about how bikes generate electricity and an idea of how devices like GPS units, cell phones, media players, etc. use it. We've rigged a number of 12-volt power adapters on various bikes using everything from $3.99 lighter adapters from the auto parts store (photo: right) to relatively expensive marine grade adapters (photo: center) to bike specific units with handlebar mounts and a wiring harness (photo: left). They'll all work just fine and the choice of which to use comes down to time, inclination and the desire (or lack thereof) to build a wiring harness and engineer a mount. For our CRF450X we chose the Trackside Universal 12 Volt Power Adapter, recommended to us by reader Jimmy Stocker, available at cyclegear.com. 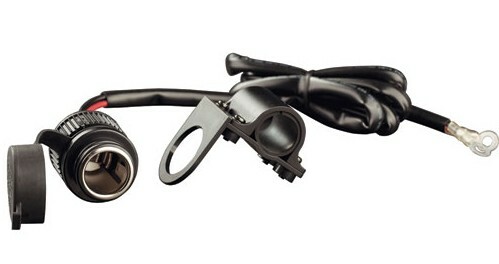 We chose this unit because it comes with a wiring harness and a handlebar mount for less than $20. We mounted our Trackside Adapter on the frame of our 8" HID race light where it's out of the way and wired the spades on the other end of the harness to the hot side of our light switch and a frame ground. Since our lighting system is DC HID this connection is the same as hooking the adapter directly to the battery. This entire installation took a grand total of 30 minutes, 10 of which was spent looking for a small screw we dropped that rolled underneath the bike lift. Any motorcycle with an electrical system with enough capacity to power lights can accept a power adapter. The charging system of a motorcycle consists of a stator (a magnet attached to the end of the crankshaft that rotates between a number of wire coils) that produces alternating current to run the ignition system (coil and spark plug). Some of the stator's output must be rectified (converted to direct current) in order to charge the battery on bikes so equipped. A power adapter requires a steady 12-volt DC potential so it needs to be wired directly to the battery (on bikes without a battery or an aftermarket stator it's unlikely that even rectified current will fall withing the range required to run must consumer electronic devices). The harness supplied with the Trackside unit is intended to serve this purpose but at around 20 inches in length it's far too short for most dirt bikes. Many installations will require lengthening the leads. It's not absolutely necessary to fuse the power adapter itself because nearly everything that plugs into it will have its own fuse (ours is fused because the lighting harness it's wired to is fused). Corrosion is actually a bigger problem than an electrical short if the power adapter gets soaked. The Trackside unit has a really beefy weatherproof cover that absolutely keeps moisture out. We like the Trackside unit quite a bit. We're not so sure that the plastic handlebar mount will last forever and would like a longer wiring harness but other than that its terrific. At $9.99 you can't go wrong. The Rad: Keeps your GPS back lit as long as you want. The Gnarly: Wiring harness is too short to reach the battery and way too long for anything else. Plastic handlebar mount looks fragile. The super stout CASCO marine unit pictured above is available for around $19 but comes without a wiring harness or mount.